Our friend and skipper, Mark Burton, arrived from the UK last night – breathing fresh air into the languor of the Tampa heat as my husband and I adjust to our new, tighter quarters. To say that Mark is passionate about sailing is an understatement. Mark is from the Isle of Wight in the UK, and has sailed hundreds of thousands of miles, crossing oceans and racing sailboats. Mark left his past profession to pursue sailing. After saving a full years’ salary, and moving to an RV, Mark began his career transition and now skippers full time. When I asked him why he enjoys sailing, he says he enjoys the freedom. We feel very fortunate that Mark is available and inclined to spend the next three weeks with our family. This is his holiday time. With Mark, we plan to build our sailing skills. 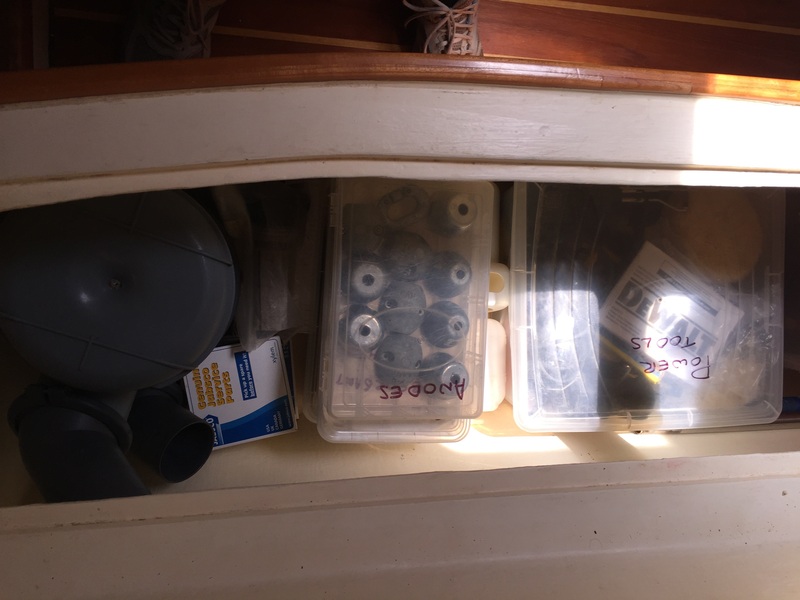 But, with our boat being ‘on the hard’, Mark has offered to help us get organized. He expects it will take us four days to sort, label and arrange our gear on the boat. 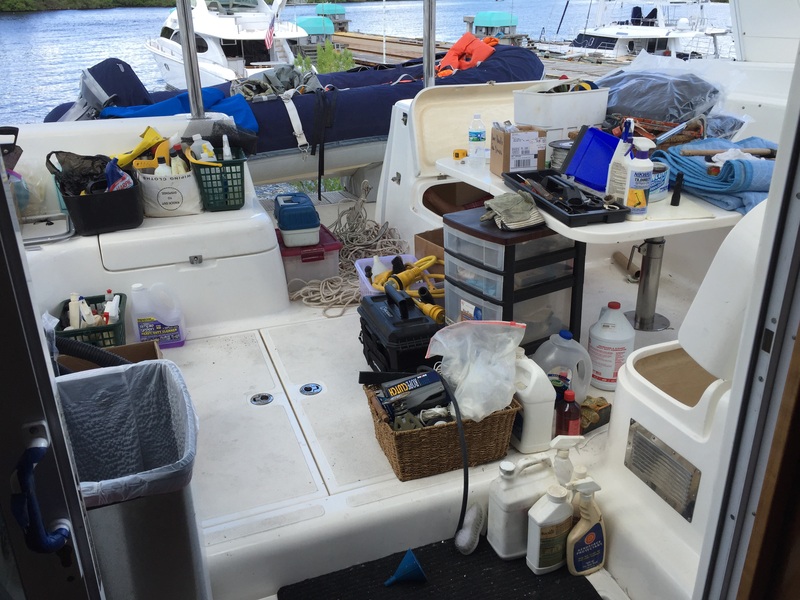 Our end goal is to create a schema of the boat that provides a top-down view of where are belongings are stored. We will also be listing the contents of the lockers and posting the lists on the inside of the lockers themselves. The lists will be high-level, such as ‘electrical’, not detailed down to the last wire. removing all cardboard from the boat. Cardboard provides a nesting ground for bugs. labeling medication and storing it in double Ziploc bags. Because our children are very young, the medication has been stored up high for safety. It’s only been a day, but we have made fantastic progress. Behold the mess in our cockpit. Spares, tools and chemicals litter the cockpit as we try to determine what is garbage and what can be kept. And, here is a locker arranged by Mark. Locker in the forward, starboard berth. Clear, plastic boxes are neatly labeled. We are fortunate to have met people who have sailed all of their lives and can offer advice on everything from electric winches to laundry. And having assistance from people with experience like our advisor, Pat Reischmann, or Mark Burton, makes all the difference in the world as we complete the refit and transition to our new lifestyle of being full-time cruisers.